With the one-year anniversary of the Deepwater Horizon oil rig explosion looming, PRWeek revisits our coverage of BP's response to the crisis in retrospect and assesses the impact on all parties affected. Nearly a year has passed since the April 20, 2010 explosion at BP's Deepwater Horizon oil rig that killed 11 workers and caused millions of gallons of crude oil to spew into the Gulf of Mexico. And while the world's worst oil spill was finally sealed in September, the reverberations are still being felt across stakeholders ranging from BP and the oil industry to the region's tourism and seafood industries. A report released on January 5 by the White House said cost-cutting and a lack of safety protocols by BP and its partners contributed to the spill. BP's response to the explosion should have been a collaborative, well-coordinated effort that would have given the emergency response a single, authoritative voice. That's because following the 1989 Exxon Valdez spill in Alaska, Congress passed the Oil Pollution Act, which requires government and the responsible party to set up a Joint Information Center (JIC), a central "mechanism to organize, integrate, and coordinate information to ensure timely, accurate, accessible, and consistent messaging." The JIC reports to a structure called Unified Command, made up of leaders from the responsible party, in addition to various government agencies. Dave Samson, GM of public affairs at Chevron, says the set-up has its challenges. "With Unified Command, a lot of the communications would have been driven by the US Coast Guard. There would have been requirements before BP could communicate and how they could," he explains. "BP was obviously trying to communicate in the most extraordinary and extreme of circumstances given how information moves today, in addition to the constraints of working in the confines of Unified Command." Indeed, BP made some PR gaffes that began to crack the Unified Command structure. Seemingly unguarded comments by former CEO Tony Hayward, such as "I want my life back" and the spill is "relatively tiny" compared "with the very big ocean," came off as arrogant and dismissive. Media also accused BP of playing loose with the facts; it often changed oil spill estimates and seemed initially reluctant to provide live video feed of the ruptured pipe. John Mullane, principal of Calumet Communications Group, which has responded to oil spills for more than 20 years, says, "The perception became that BP was also in charge of the response." He says BP's image likely would have been in a better position today "had the government taken a more conspicuous role in the joint information process early on." Instead, CBS News was among media entities who asked, "BP or US: Who's in Charge Here?" Mullane says the "I want my life back" comment "was the proverbial straw that broke the camel's back. Hayward was trying to show his commitment to getting this done, but good media training would have told him not to go down the road," he adds. "A few days later, that's when the government said, 'We will be doing the communications from now on.'" That was on June 1, when Thad Allen, the government's national incident commander, said he would hold daily press briefings without BP. In July, the White House replaced the deepwaterhorizonresponse.com website, which the Unified Command's JIC launched, with RestoretheGulf.com, the "official federal portal for the Deepwater Horizon BP oil spill response and recovery." Certainly, the breakup of the Unified Command structure can, in part, be blamed on BP's initial blunders. By splitting from Unified Command, one could argue that the government was, in a way, helping take the heat off BP. But Gerald Baron, EVP of communications for O'Brien's Response Management, which worked with BP on the emergency response, believes the actions of the administration were politically motivated. "The government understood the media and public seemed to have a hard time with the idea of BP being a part of the recovery and communications response," he says. "And the administration also had a desire to avoid the 'Obama's Katrina' label, which is why it decided to make it very clear it was definitely in charge." Baron says companies should modify their emergency response plans to take into account such scenarios. "It is much better to stand together and work cooperatively, but if the federal government does this again for political reasons, companies must be ready to communicate independently to protect their reputations," he says. Many observers have said digital communications truly came to the forefront as a response tool during this crisis. According to O'Brien's Response Management, whose PIER (Public Information Emergency Response) system was used by BP to manage daily public affairs operations, the Deepwater Horizon website generated more than 150 million page impressions from April 22 to September. At the height of the crisis, from late May to mid-June, it sustained an average of more than 3 million impressions per day. More than 60,000 comments were submitted to the Deepwater Horizon website, the Facebook page connected with 40,000 "fans" by mid-August, and the Twitter handle connected with more than 8,500 followers by mid-August during the peak of the response. Baron says five to seven staffers were focused on managing and responding to inquiries. "BP did raise the bar in crisis communications," says Chris Gidez, US director of risk management and crisis communication for Hill & Knowlton. "Show me a company that did or invested as much in communications. Its website was incredibly substantive, very interactive, immediate, and dynamic. I don't know if this is part of their decision process, but clearly they didn't want any comparisons to the passive response of Exxon Valdez." The BP website incorporated a wide range of visuals, including videos, slideshows, and diagrams. It also showed live video feeds of the oil flowing into the Gulf. "Companies or agencies will not have a choice going forward to show those feeds because of public and political pressure," explains Baron. In response to the crisis, the tourism departments of the beach-lined Gulf States, including Alabama and Florida, invited people to post pictures of the beaches so viewers could evaluate the impact for themselves in real time. Nonprofit Visit Florida, which partners with the Florida Commission on Tourism, launched Florida Live, which links to live webcams and Twitter feeds from some of its 3,000 or so tourism partners around the coast. "We were able to become a reliable, trusted source of information by delivering photos and messages in real time," says Chris Thompson, CEO of Visit Florida. "It became our main communications piece." In addition to showing people the importance of digital-driven outreach, PR pros say the BP oil spill has served as a wake-up call to any industry in terms of emergency crisis planning. "Companies might have tried to write crisis plans based on the most probable of events as opposed to the events that could really threaten their license to do business," says Gidez. "Now companies need to be as prepared for the black-swan events as for the more routine ones." Having managed to survive its own black swan, at least so far, BP will presumably continue to try and repair its reputation, with new CEO Robert Dudley leading the way. It won't be easy. 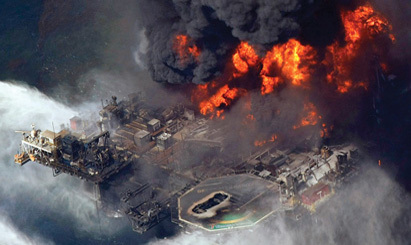 The federal government has filed a civil lawsuit against BP and eight other companies involved, including rig owner Transocean, contending, among other things, that they violated environmental laws and failed to provide adequate protection for staff and the environment. In a statement, Daren Beaudo, press officer for BP America, says the company will answer the government's allegations in a timely manner. "Alone among the parties, BP has stepped up to pay for the clean-up, setting aside $20 billion to pay all legitimate claims," he adds. "We took these steps before any legal determination of responsibility and will continue to fulfill our commitments in the Gulf as the legal process unfolds." The actual spill only lasted five months, but its impact on BP and other industries will be felt for years to come. Moreover, it will be remembered as a fundamental landmark moment in crisis communications. "The [drilling] moratorium has lifted, but the bidding process is still not moving forward in a way that allows us to resume work in terms of exploration and developing energy in the deep water of the Gulf," says Dave Samson, GM of public affairs at Chevron, which announced a $26 million-plus capital budget for 2011, with a key portion earmarked for the Gulf. He says the industry has focused on safety in its communications. "Deep-water Horizon served as a call to action for the industry and we've responded on a number of fronts in terms of safety, prevention, and response," says Samson. The American Petroleum Institute (API) has also communicated new safety initiatives on its Energy Tomorrow blog. "We're also using the blog to communicate the industry's importance to the economy and job creation," says Jessica Pointer, API's digital comms adviser. Gulf Coast states have embraced a combined effort, developed by PR firm Story Partners, called "Ready 4 Takeoff," a coalition aimed at creating new jobs and representing 100-plus companies, municipalities, and regional business groups. The coalition's PR efforts have focused on urging the federal government to buy Gulf Coast seafood and secure the construction of a KC-45 Real tanker in Mobile, AL. It operates a website (Ready4TakeOff.org), social media channels including YouTube, and a Facebook page, where supporters can sign a petition informing the government that help is needed to rebuild the region. "The goal is not about asking for new government spending," explains Story Partners founder Gloria Dittus (pictured), "but it's about reprioritization." "The brand of Louisiana seafood has been pretty beaten up," explains Ewell Smith, executive director of the Louisiana Seafood Promotion and Marketing Board. To combat this, crisis communications focused on media outreach, social media, and a website about the spill, LouisianaSeafoodNews.com, featuring news articles about the seafood's safety written by a former CBS News journalist. Thinking long term, Smith says the industry is working on developing a certification, traceability, and sustainability program for its seafood. The board has also received $30 million in funds from BP earmarked toward marketing. "We'll be putting together an RFP to work with a major agency on rebranding efforts," says Smith. "It is about making people understand seafood is safe." The Louisiana Office of Tourism's ongoing media relations strategy involves a network of about 85 experts in subjects such as food, music, and outdoor pursuits, who do media interviews. "We share with our network ongoing messaging so they can be on strategy," says John Deveney, president of Deveney Communication, the PR firm that works with the office. The beach-lined Gulf States relied on user-generated content to show the condition of its shores. Visit Florida, that state's official tourism marketing corporation, encouraged the community to upload photos to its website and Facebook page. "Floridians became our ambassadors," says Chris Thompson, CEO of Visit Florida. "They were more compelling than anything we could have generated via normal media channels." More than any other US region, the Gulf Coast states have had to overcome serious natural and man-made disasters, from Hurricane Katrina to the BP spill. "I'd like to see corporations and government look at the Gulf as a laboratory to revitalize the economy," says Norma Jane Sabiston, a government relations official working on recovery efforts. "The region can serve as an example of how to handle these kinds of setbacks." Indeed, in virtually every sector, people in the South look at such disasters as an opportunity to be better than before. "New Orleans looks better than it has ever looked because a lot of things were rebuilt," says Ewell Smith, executive director of the Louisiana Seafood Promotion and Marketing Board. "As horrific as this experience has been, the goal is for the South to send the message that it will come out a whole lot stronger." BP's task is restoring its image following one of the worst man-made catastrophes in recent memory and a lawsuit filed against it by the federal government. The company has continued to use social media to communicate its clean-up efforts in the Gulf. Most recently, it published a Facebook Q&A session with Mike Utsler (pictured), COO of BP's Gulf Coast Restoration Organization. "There was no PR solution to the fact they spilled oil in the Gulf for four or five months," says Gerald Baron, EVP of communications for O'Brien's Response Management, which consulted with BP on the emergency response. "The best they can do is communicate humbly and with deep regret, which is what they're doing. And they need to tell everyone at every chance they can what they're doing to fix the situation."